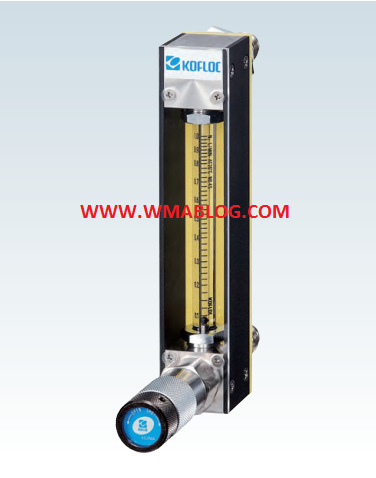 The Model RK1500 Series Flowmeter is equipped with a bellows seal type needle valve so that it can withstand high vacuum, high pressure, high temperature and toxic gases. 1. High reliability against leak is ensured because 100% leak test is conducted before shipping, using a helium leak detector. 2. Bellows seal type needle valve perfectly eliminates leak from the valve stem. 3. Superior corrosion resistance is ensured by using SUS 316,FKM, fluorocarbon resin and Pyrex glass only for wetted parts and those which are exposed to other fluids. 4. Enhanced stability and repeatability are ensured using a flowmeter consisting of a precision-formed try-flat, rib-guided glass tube and ultra-precision ball float in combination with a sophisticated needle valve. For other gases, consultation is necessary regarding whether conversion conditions or calibration by actual gas is to be used. For other liquids, consultation is necessary regarding whether conversion conditions or calibration by actual liquid is to be used.